Custom Printed Tacky Floor Mat – featuring any graphic, logo, or slogan! Showcase your company logo or slogan with our Custom Thunder Mats™ Custom Logo Tacky Floor Mats. Your logo or slogan will be printed on the reusable frame at the base of 30 clear layers of adhesive film. The frame and mats measure 23.5″ x 31″. Base options include non-sliding gripper surface. 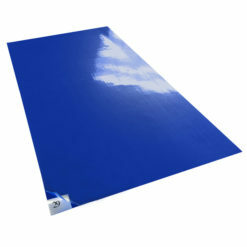 Thunder Mats are designed to effectively capture particulate from foot traffic and equipment wheels upon entering a cleanroom. The clear tackified mats contain numbered layers that easily peel off to reveal a new clean surface.